Learn about the Ghost Towns of Nevada by reading Nevada Ghost Towns by Charlie Spence, Aviation Writer. It features a mini, but thorough tour of the destination, plus all you'll need to know to plan your trip including getting there, objective information on places to stay and eat, and things to do. Enjoy! When you think about a trip to Nevada probably your first thoughts are of Las Vegas or Reno and the fabulous hotels, glittering shows, and crowded casinos. If so, you are missing some of the most interesting places that can transplant you from those modern Meccas to the roaring days of gold and silver rushes'the Nevada Ghost Towns. Gold and silver played important roles in Nevada long before modern gambling. In 1849, gold was discovered at a tent trading post near a community now called Dayton. A few years later major silver and gold deposits were unearthed a little farther north. The rush was on. Towns and mining centers sprang up throughout the state. At least 575 towns, settlements and camps flourished for a half-century. 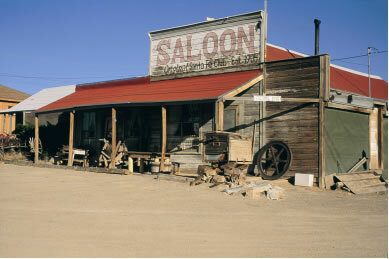 Today, ghost towns and historic mining towns are found all around Nevada's scenic deserts, waiting for your exploration. Some of these historic mining towns are still inhabited with thriving businesses and fascinating attractions. All, however, are much smaller than they were in their boom days. Many of these interesting locations have airports, but the best way to thoroughly soak up the rich wonders of this unique area is to tie down your airplane at your arrival point, rent a car, and set out for a nostalgic journey. The route to your destination can be just as interesting as the destination itself. Ten scenic highways lead you through landscapes, tribal lakes, and historic or modern communities. Unless you have unlimited time to devote to this pleasure, it's best to select one or two routes on each journey to the Silver State so you can thoroughly enjoy what these places have to offer. One trip to the past starts in Las Vegas. Go north on route 95 and your first stop might be at Amargosa Valley where big sand dunes cover about three square miles. The dunes are the remains of a prehistoric lake that covered this section. Height of the dunes reaches 500 feet with some sharp drop offs. 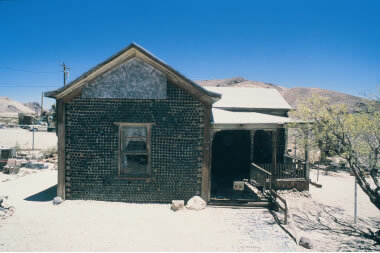 When building materials were scarce, this house near Rhyolite was constructed of bottles. It stands today waiting for you to examine it. Continuing north on 95 you will come to Beatty with several motel/casinos. Four miles west is Rhyolite, your first sight of a true Nevada ghost town. In 1904, the 'Bulldog' strike brought some 6,000 residents to this town. They brought a modern telephone system, electric streetlights, hotels with private baths, water companies, dozens of saloons, a symphony orchestra, and newspapers. Late in 1907, a national panic caused the mines to close. Residents deserted for Los Angeles and a new community in the southern part of Nevada'Las Vegas. Persons continued to leave and by 1920 the town was deserted and many of the buildings were dismantled for the building materials. The old train depot and the concrete ruins of an old bank, important buildings in the bustling days of mining, still stand. Also, take time to look at the house built of 20,000 bottles in 1906 when building materials were scarce. Rhyolite, named for a type of volcanic rock found in the area, is one of the most photographed locations in the state. One of the old saloons that dotted the town of Goldfield in the roaring days still can be visited today. Look through the windows and you can almost hear the honky-tonk piano and the ruckus of the unwinding miners. Continue north on route 95, skirting Nellis, the secret military base, and conjure in your mind the types of experiments that might be going on in there as you pass by. Goldfield and Tonopah welcome you to the mining days. Rich gold deposits were discovered in 1902 and within a few years Goldfield had a population of more than 25,000, making it the largest city in the state. There were dozens of saloons, banks, and the most luxurious hotel between Kansas City and San Francisco. Many of the historic buildings remain, some still in use by the much smaller community. The courthouse and old Goldfield Hotel (now closed) are reminders of those golden days. At this point you are about half way between Las Vegas and Reno. Here you can retrace the route and visit those spots where you said 'I wish I had spent more time,' or take a return route to Las Vegas on the eastern side of Nellis. If you feel adventurous, take a different tour'the route of the old Pony Express. Although this communication service lasted only about a year and a half, its exploits are legendary. Daring young men, with leather mail pouches strapped to their horses, crossed the area carrying the mail the 1,800 miles between California and Missouri in 10 days. Indians, desperadoes, weather elements, and fatigue were only some of the dangers faced when this was the only means of communication between the nation in the east and the developing, untamed west. 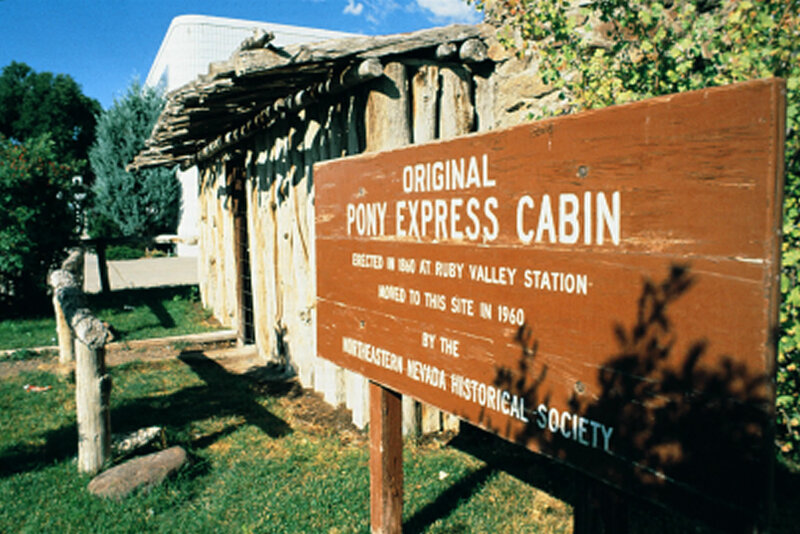 Stop by one of the original Pony Express cabins you will find along 'The Loneliest Road in America". Today you may follow that same route across Nevada along highway 50, called by a magazine 'the Loneliest Road in America.' Begin this journey through the old mining towns at Reno or Carson City; either has a good airport and rental cars. The route across Nevada's section of the Pony Express route is 346 miles so if your time is limited plan your stops to catch only a few of the interesting places. Accommodations are available at most of the communities along the way. One of your first stops might be Fort Churchill. Now an historic state park, Fort Churchill was constructed in 1860 to protect western Nevada settlers and travelers on the trail west. The fort ruins have been preserved. The park offers camping, horseback riding trails, and is a favorite spot for users of off-road vehicles to travel the 16-mile dirt track along the banks of the Carson River. Just 15 miles east of Fallon visit Grimes Point and Hidden Cave for a look at the region's prehistoric past. At Grimes Point wander through rocky areas covered with ancient Indian Rock carvings. Take time to look at the artifacts uncovered in the area by archaeologists. Your next stop is Austin, which remains one of the best, unreconstructed mining camps. Along the way you can see the Pony Express stops, marked at Cold Springs, Middle Gates, and Sand Springs. Travel about two hours from Austin and you are at Berlin and Ichthyosaur State Park (pronounced ick-thee-o-sore). Ichthyosaurs were the marine reptiles that swam in the ocean that covered Nevada some 225 million years ago. You can take a look at some of the remains of these ancient reptiles at the park's fossil house. In 1895, silver was discovered here and the town of Berlin was formed. A large mill was erected to process the ore and this flourished until the mines closed in 1918. About 250 persons lived in Berlin, including miners, woodcutters, a forest ranger, a doctor and nurse, and a prostitute. There were a store and post office, stamp mill, assay office, and stage station as well as houses. Most of these buildings still remain as a ghost town for you and future generations to see. As you walk the deserted streets of Berlin, learn from the descriptive signs, and peer into the windows of the abandoned structures while you let your imagination run wild with the way this untamed western town was a century ago. More than three miles of tunnels reveal where the prospectors pulled an estimated $895,000 from the earth when gold was $20 per ounce. Take a tour of Diana Mine and see the tools these miners used: ore cart, timbering, and other mining tools. Venture into the side tunnels. For times when tours are available and to make reservations, check the web site www.parks.nv.gov. You can continue along the old trail through Eureka and Ely, if your schedule permits, or retrace your route. Whatever your choice, the routes always offer something new. Ghost towns and mining towns are found all over the state. 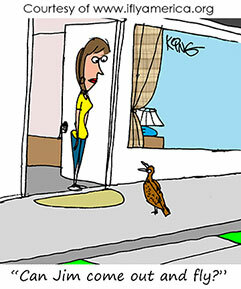 In Nevada, the odds are with you that you will find a winning selection of interesting places to visit. If you plan to start your Ghost Town tour in Las Vegas, you can land at any one of several good airports. McCarran International is the main airline terminal, about five miles south of the city. North Las Vegas, about three miles northwest of the city, is the principle general aviation field. Henderson is also available, some eleven miles south. All have parking and hanger fees. McCarran and North Las Vegas have published instrument approaches, but weather is rarely a problem. If you want to start on the Pony Express tour, try Reno or Carson City for your landing point. Reno/Tahoe International is the commercial service field with published approaches. It is three miles from the city. Reno/Stead is ten miles northwest, Spanish Springs seven miles north. At Carson City the airport is three miles northeast. All have rental cars and hangar or overnight fees. The sun can get very hot in the desert so if you plan to park the airplane for several days consider getting it in a hangar or in other shade. All of Nevada offers a wide variety of accommodations ranging from inexpensive motels'$45 to $100 a night'to plush hotels. There are many Bed and Breakfast spots. You can even rent a houseboat. Rates of all vary with the location, the season, the quality of facilities. For the best bet, use IFA's Online Travel Booking Service where you can check rates and book your room and rental car.Significant hotel and car rental discounts may apply. Notice: This information is current as of August 2005. It is recommended that you contact the numbers, and/or visit the websites above to determine any changes to the information.